Deck boards made from tropical hardwoods are naturally resistant to insects and decay, and come in a variety of beautiful dark colors. Your dream deck is just around the corner – you’ve measured out your yard, you’ve picked a design, and now it comes time to select the materials. Take a moment to read about the different types of woods available as materials for your new deck. 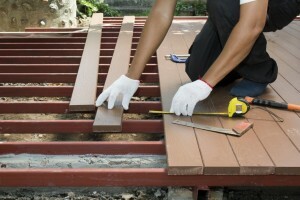 Pressure-treated wood decks are long-lasting and inexpensive. Most pressure-treated wood is made by forcing chemical preservatives into the cellular structure of the wood. These preservatives help to protect the wood from attack by termites, other insects, and fungal decay, though they also make the boards highly corrosive to non-treated metal fixtures. Pressure-treated wood is often Southern yellow pine, which makes it easy to stain any color you might wish. Tropical hardwoods are also long-lasting and durable, though they can be incredibly dense and heavy. Some woods are so dense and heavy that you cannot simply hammer in a nail – they need to have pre-drilled holes or the nail will simply bend! Deck boards made from tropical hardwoods are naturally resistant to insects and decay, and come in a variety of beautiful dark colors. Redwood and cedar are both gorgeous, red-toned and light-weight woods available for decking materials. Like tropical hardwoods, they are naturally resistant to insects and decay; unlike tropical hardwoods, cedar and redwood are both very soft and can be easily damaged by foot traffic and sun bleaching. Thus, decks made with these woods require frequent sealing and application of sun-resistant finishes. Made from a combination of recycled plastics and waste wood fibers, composite decking is an eco-friendly answer to wood decking. Composite boards are weather- and insect-resistant, and come in a wide variety of colors, finishes, and looks. They are less stiff than traditional wood decking, and may fluctuate based on the outside temperatures – make sure you have a professional install our deck to prevent gaps. 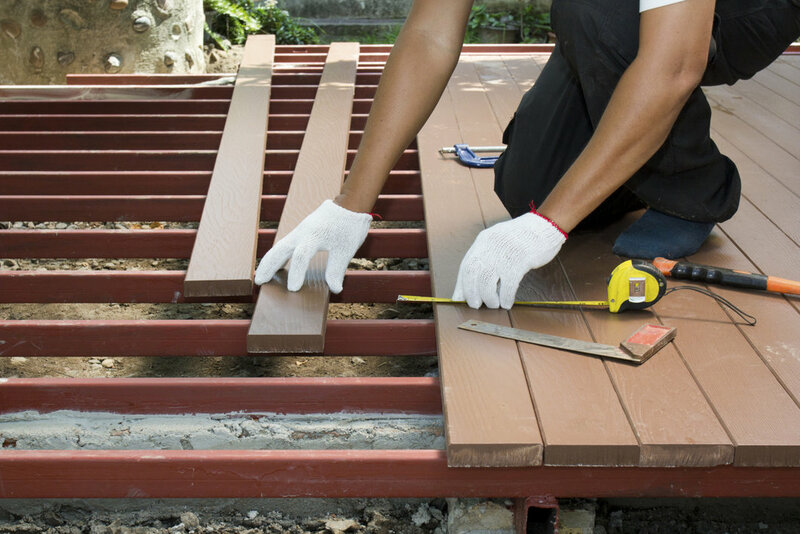 Are You Ready To Invest In The Deck Of Your Dreams? Mid- Atlantic Deck and Fence has been building custom fences and decks throughout Maryland since 1987. Today, we are one of Maryland’s leading and most innovative deck and fence companies. Mid-Atlantic Deck and Fence offers many different styles of standard wood fencing as well as custom design built fences to choose from. We are also one of Maryland’s only manufacturer and installers of vinyl fencing. If you have any questions about Decking in Baltimore, please contact Mid Atlantic Deck & Fence (MAD Fence) today by clicking here or calling 1-800-833-9310. You can also follow us on Facebook and Twitter as well.